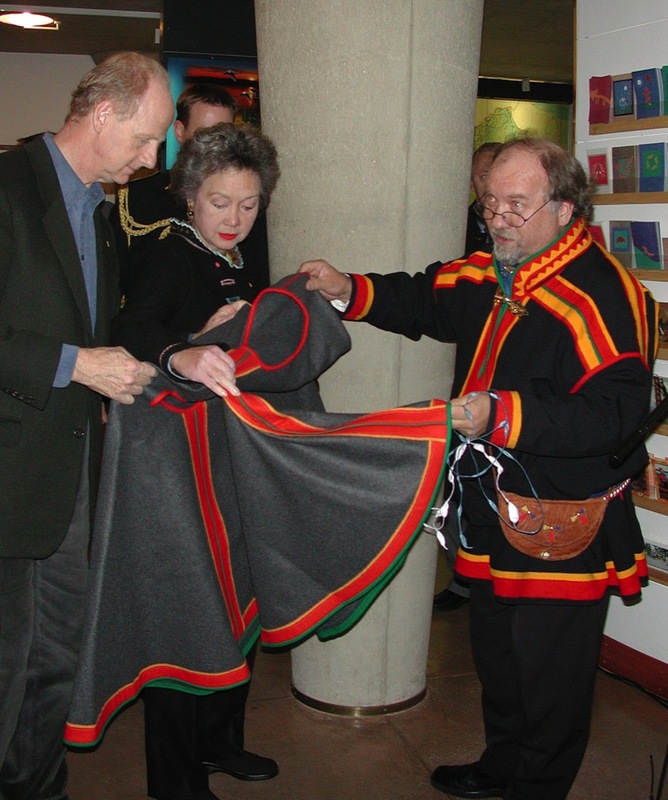 Here was the real treat for me as I tagged along on the 2003 state visit with Governor General Adrienne Clarkson to Finland and Iceland. 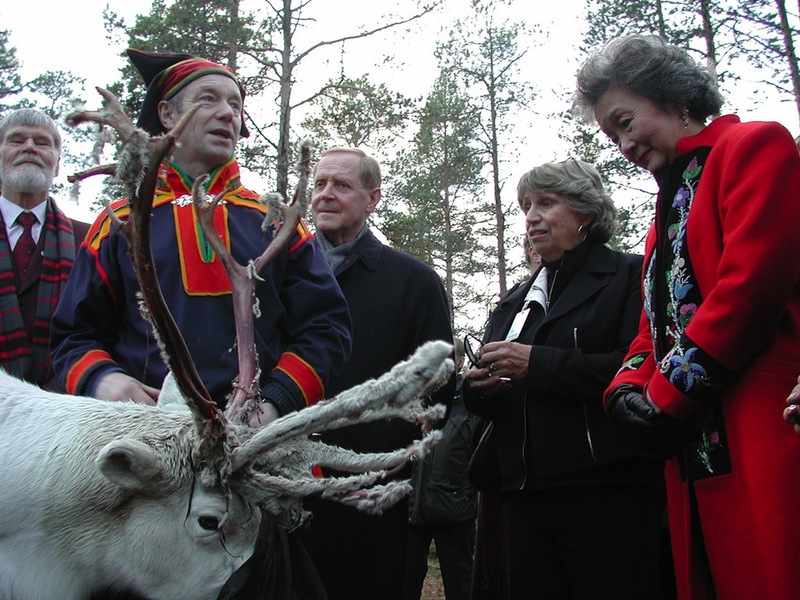 This state visit took me back to Inari, a Saami centre of in northern Finland with a population of about 2,200. The stop there offered a chance for Saami, Inuit — three on that leg of the trip — and the other Canadian visitors to learn more about Saami culture, and share. The discussions in Inari stuck closely to the issues such as people, culture, the land and animals, in contrast to the previous stops in Finland. In Helsinki, Clarkson’s husband, author-philosopher John Ralston Saul, presided over a noon-ish wine tasting — of Canadian wines — at the downtown Sipuli restaurant that left me dizzy. And, in the city of Oulu, Finland’s northern high-tech centre, officials seemed puzzled about why the Canadians, who mispronounced the city’s name (oh-loo) as oooo-looo or ow-loo, were there at all… although the Oululaiset knew what to serve for lunch: wild mushroom soup, moose steak and berry mousse. 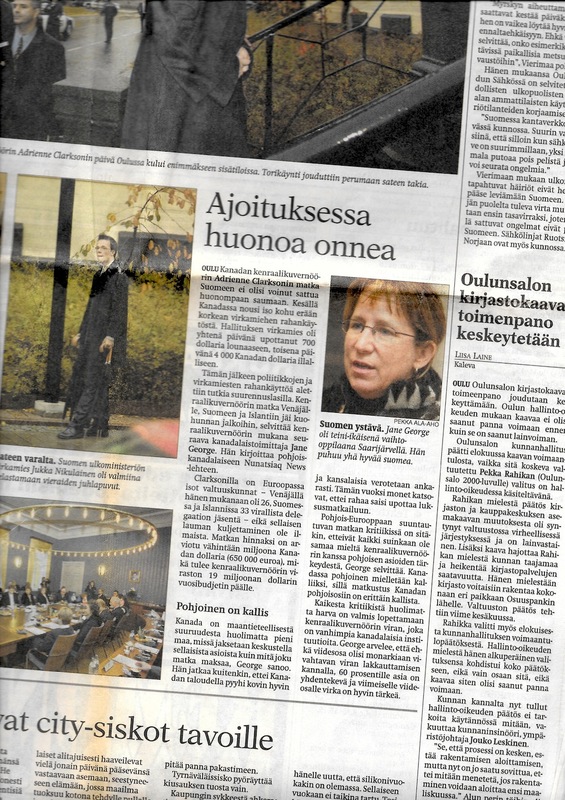 Oulu’s daily newspaper, the Kaleva, took pains to describe Clarkson’s visit as well as her role in Canada. A journalist from that newspaper had even visited Iqaluit before the GG’s visit as a way of informing readers in Oulu about Canada’s North, and also interviewed me in Finnish — which I had learned as a young girl. But Oulu’s vision of what a state visit should look like appeared to be an event designed around trade-deal signings rather than talk, as was the case in 2003: at a discussion at the University of Oulu on “Change and Development in the Changing World,” presentations and comments came largely from Canadians or non-Finns, and few students attended the open session. A Canadian government official on the state visit maintained that it was important, despite the lukewarm connection, to show Finland that Canada isn’t simply about hockey and snow. Instead, I thought, it would be perceived as a land of wine, haute cuisine and academic talk? As for Clarkson, at the next stop further north in Inari, the focus on good food continued as she asked what reindeer usually eat. That question came as a Saami herder fed a plump animal. “They like birch leaves and mushrooms. This summer, there were plenty of mushrooms so they’re well-prepared for winter he said. At the reindeer farm outside Inari, inside a fire-lit tent called a lavvu, Into and Marit Ann Paadar accompanied their traditional drummer, the romppu, and performed Saami songs or joiks. Into and Marit explained that Saami in Finland have three very different ways to say thank-you, depending on which Saami group they come from — giittu, takk or spasi. When the couple married 30 years earlier, they said couldn’t understand each others’ dialects, so they adopted Finnish as their common language. We also visited Inari’s Saami museum, called the Siida or “village,” where young Saami singers provided the entertainment and Saul and Clarkson received gifts of Saami capes. “Clarkson gushed over the thrill of finally meeting people dressed like the colourfully dressed ‘Lapps’ she’d read about in history books as a child,” I finally wrote in Maclean’s. “Woops,” I thought at the time — that was like calling Canadian Inuit “Eskimos” — but the polite Saami smiles only froze at Clarkson’s gaffe. 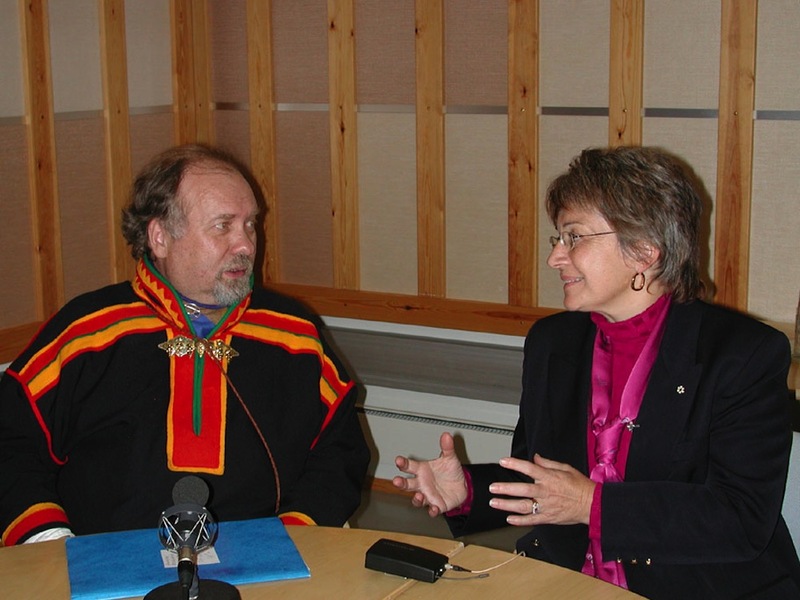 Later in Inari, Sheila Watt-Cloutier, then the president of the Inuit Circumpolar Conference (now Council), Piita Irniq, who was the Nunavut commissioner, Mary May Simon, Canada’s first Arctic Ambassador, and Clarkson joined the president of Finnish Saami parliament, Pekka Aikio, someone I’d first met 10 years earlier, at the Saami radio station for a discussion that aired on Saami radio and television. The importance of the reindeer, said Irniq, reminded him of the importance of the seals in Inuit culture. But unlike Inuit in Canada, Finnish Saami, whose parliament has only advisory powers, have no rights over their land, Aikio said. But there wasn’t much time to think about that as we rushed from Inari to the Ivalo airport and back to Rovaniemi for the night and then, the next morning, to Iceland. Read more about Siku girl’s 2003 state visit to Finland and Iceland on A Date with Siku girl. You can read the first instalment here.